The best way to get to the admin is to go to www.yourwebsite.com/catalog/myadminarea this should take you to the login page. The username is always admin. If you forgot the password click on Resend Password. It should then email you a new password. Once you get this, copy and paste it into the password box. You will be asked to reset your password right away. Change the password to whatever password you would like. How do I add products to my E-commerce site? Click on the category where the product is that you would like to delete. On the same line that the product is on you will see a red X.
Click on the red X to delete the product. How do I change the content on my E-commerce pages? How do I configure the taxes? Last, make sure you apply the new tax class that you created (Taxable Goods) to any and all products that you might be charging tax on. How does the Newsletters & Product Notifications work? a. Make sure your “E-Mail Transport Method” is set appropriately for the webserver you’re using. d. Email Archiving Active? = We recommend setting this to “true” — note, this will increase your database size regularly. Where do I go to send HTML messages (Newsletters)? You can send newsletters from the admin area, under the “Tools” => “Newsletter Manager”. This works with Product Notifications, since they’re generated with the Newsletter Manager screen, too. You can also use “Tools” => “Send Email”, or in your Admin “Customers” => “Customers” screen, click “email“. Same for your Coupons, Gift Certificate Mail, and Gift Certificate Queue. You can optionally toggle the HTML editor’s “source” option on (check the box, or click the symbol), and just paste raw HTML into the editor directly, if you wish. How do I set up my Paypal account to work with my E-commerce? If you have a “My Selling Tools” tab on the left navigation area, click it and go to the next step. Otherwise you’ll see two or three columns of choices. You’ll want to click on the “API Access” option in the first column, and skip the next step. Click the “Request API signature” radiobutton then click “Agree & Submit” button (after agreeing to the terms). Select the value listed next to Signature Hash, copy it, and save it to a file or some other location. This is your API Signature. Use the values from #7 and #8 to configure the API SIGNATURE settings in the PayPal Express Checkout module in your Zen Cart® admin area. How to setup what credit cards you will accept? In your admin area go to Configurations => Credit Cards and enable any cards that you would like to use. After doing this if there is still a problem please contact your gateway provider and make sure that they have it setup on their end. How do I setup Group Pricing? You will need to select which Customers get what Group Discount. Scroll down until you see Options and then select the discount that you would like this customer to have. How do I setup my Shipping Module? How do I configure my shipping module settings? Click on the Module that you would like to edit and then click on the edit button to the right. Once you make your changes done make sure to click on the update button at the bottom. If you are setting up 1st Class shipping for USPS and it is not showing up do the following. Change settings to 0:0 and then click update. How do I set up table rate shipping module? So if anything under $25.00 is $5.00 to ship it would look like 25:5.00, and the next one. There is an example above the box. Select By weight or price. How do I edit the Product Price Manager for adding Tax Class? How do I do a database backup on my site? Select an Option Type: The way it will be displayed on your Shopping Cart. Repeat to Build All Categories Options. Depending on what you want to do with attributes there are several methods to price, add weight, sort order, and mark the type of attribute this is. Be sure to click Add to add the newly-defined Attribute. You repeat these steps for each color or size available for that product. In the Admin, make a new category called Gift Certificates. Add a product to the category called Gift Certificates. This is up to you, if you choose to price by attributes you only need a single ‘product’. • Products Price (Net): Your price or zero if pricing by attributes. • Always Free Shipping: No. • Products Description: Your description. • Products Quantity: leave blank or put in a large number to track number sold. Click Preview and then Save it. Now go to Modules->Order Total and click Install to install and/or Edit to configure the ot_gv Gift Certificate module. After the Administrator has approved the Gift Certificate (There’s a “release” button in admin area if someone buys one), THEN the Gift Certificate funds are made available to the customer. The customer can then USE those funds for themselves, OR they can email them to friend(s) via the links provided automatically in the store (esp shopping cart sidebox). They can email as much as they want, to various people, up to the amount they’ve purchased. Draw attention to gift certificates on your store, perhaps by creating a home-page graphic with a link to your gift-certificates category. Sometimes people will create a new sidebox just for drawing attention to this sort of thing. When Gift Certificates are purchased, be sure to log into your Admin area and release them if you’ve configured it to queue them rather than auto-release them. How do I Disable the Birthday Module for Customers? Click False and Hit Update. How do I put items on sale on my ecommerce site? After logging into your admin area of your site please follow the instructions below to post items on sale. 1. Roll your mouse over Catalog on the menu and select Specials. 3. Now select the item that you would like on sale. What exactly does the counter history tell us? Those counters show “unique hits” and “hits”. The number of “sessions” is the number of unique “sessions” started on your site. A session is typically started when a browser comes to your site. The “total” is the number of pages browsed, regardless of the number of sessions started. So, three separate visitors would normally start 3 separate sessions. If one of those visitors clicks on 4 pages, and another on 7 pages, and another on 2 pages, then the “total” would show 4+7+2 = 13. Now when shopping, the customer can choose the format. Depending on your downloads you will want to adjust how you configure things. If using Radio buttons and have multiple selections, be sure to set one as a default. How do I setup my store to show prices only if the customer is logged in? Admin > Configuration > Customer Details > Customer Shop Status – View Shop and Prices – set to 2. How do I remove the New Products for "Current Month"
How do I remove the date that the product was added? How do I edit the main page and the other pages in my catalog? From the left select the page that you want to edit. Open your Admin. Put your cursor over the Configuration in the top menu, choose My Store. Locate the “Show CategoryCounts” option. Turn it off. How do I remove the arrows on the categories? How to send emails to your Customers via your website? Once you are here you just need to select the customers that you want to send it to. Make sure to add a subject. For more advance tools select HTMLarea from the Text Editor drop down. When you are done typing your email up just click on the Preview Button. This will take you to another screen to preview it. If everything looks good click on the Send Mail button. Just a little side note. If you are typing a large email up you may want to type it up in a word document first and then copy and paste it in to here. The reason I say this is because the site will time out after a period of time and you may lose your email. How do I update customer’s information? Login to your admin area and put your mouse over customers. Click on the first option Customers. Change any information that you need to. Now click the update button at the bottom and that is it. How to limit the countries you want to sell your products to? Delete the ones you don’t want. Click on any customer under New orders. On the Orders page click on the Customer name. Scroll to the bottom of the page an under Statues make your selection and then click update. How do I setup coupons and promo codes? First make sure that you have Discount Coupons installed. Go to => Modules => Order Totals=> Discount Coupons. If there is not a green dot under sort order then it needs to be installed. Just click on the word Discount Coupon and then click the install button. Now that this is installed do the following. Fill out the information for your coupon and then click preview. If everything looks good click confirm. Now try doing a test order and make sure that this works. How to setup where your emails will go from your catalog? Login to your admin area and then put your mouse over Configuration and then click on E-Mail Options. Once there you will see many options on who or where you want any or all emails to be sent. How to setup wholesale pricing? Pick a customer and click “edit”. You will see a new text box under the email address box. The number should be 0, If you change it to a number above 0 then the customer gets wholesale pricing at that level. So, if you set a customer to 1 they’ll see wholesale price instead of the retail price. If you set it to 2 they will get the second wholesale price. If there is only one wholesale price they will get that. If there is no wholesale price at their level then they get either level 1 wholesale pricing or retail pricing. In your admin area go to Configurations => Credit Cards and enable any cards that you would like to use. After doing this if there is still a problem please contact your gateway provider and make sure that they have it setup on there end. Why do my pictures in my online store load slow? It doesn’t matter if your emailing photos of your grandson or putting images of your latest product on your online store. Too many people don’t consider optimizing their photos for the web. We’ve all been on too many web pages where it seemed that the photos would never load, and sometimes they didn’t. So here are some steps to make sure that your photos show up on your site. Always have a back up original format copy of your image. Never alter the original. Believe me you will regret it. Crop to size. Make sure that you crop out any extra information that isn’t needed. Remember the larger the photo the longer it takes to load or send. Resize to reduce pixels. There should be an option to resize according to pixels. You’re going to want the largest size to be no more than 250 pixels or you can reduce the dpi to no more than 96. Reduce the color palette. Many images have millions of colors so the first thing that you need to do is reduce the colors to 256. You will lose some depth with this. Save the file in a standard format. JPEG is the most common for photos and you can compress the image with a JPEG for further reduction in file size. It’s not unusual to see GIF or PNG as well. If you’re creating a web page every photo that you add will add to the time it takes to download all of the images. If you keep the images small in size the smaller resolution will not be as obvious. How do I turn my shopping cart into a showcase? Once you logged into your admin area put your mouse over Customers and select Customers from the drop down. If they used that email address you should see their account. You should see three buttons to the right. Click on the delete button to delete their account. How do I import all of my products at once using a spread sheet? Before you import a spread sheet with products it would be a good idea to add a few products to the shopping cart from with in the admin area. The reason for this is so when you download the database you can get an idea of the format. One thing you will need when doing this is a copy of OpenOffice on your computer. You can get a copy of OpenOffice at http://www.openoffice.org/ You do not want to use Microsoft Excel. The shopping cart program does not like it. Now you are ready to add your products. Please make sure to do a database backup. If you have done this then continue to the first step of these instructions. Next click on Download Complete .csv file to edit (Attributes Not Included) The download should begin. Once the download is complete find the file on your computer and open it with OpenOffice. When you first open the file in OpenOffice you will see a few setting options. Make sure to select the options that is in the screen shot below. Once the file opens you will see your products that were already added. You can now begin adding to the database. You just need to make sure that you stick with the format that is in this file. Also do not use dollar signs ($) and you must have a model number for all products. Once you are done with adding or changing your products do the following. Click Save. Once you click save click Keep Current Format. There should be a new window that pops up. “Export Text File” Make sure that the Field Options match the screen shot below. Now we are ready to import the new database. In your admin area put your mouse over Tools and then click on Easy Populate. Click on the Browse button under Upload EP File. Select the file that you just edited from you computer. Once you do this the site may take a moment to refresh. Once it is done if you scroll to the bottom of the page you will see in green everything that imported fine. Anything in red did not. It should tell you what the problems is. You will then need to go back and fix the problem and re-import it. If everything is green go to the front end of the catalog and make sure everything looks good and is in the right place. If anything goes wrong you can always restore your catalog from the backup that you made. How to link products to other categories? If you want to add one product to more then one category then this is a great option. Once you have done this and the pricing changes or you just need to update the info. You just go to the original product make your change and then update it. Doing this will update all the other products that are linked to this one. Once there you will see a blue circle with the letter “C” in it. Click on this. Select the category that you would like to link this product to. 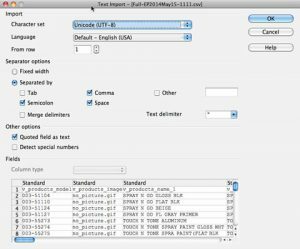 Under “Copy Method” select Link product. Click the copy button and then you are done. How do I export my customers email addresses so I can use them in other programs? Follow the instructions that are on this page. If you do not have the “Export Email Addresses” option and you would like it feel free to contact us and we can install it. How do I add Featured Products? How do I disable Categories/Products? Once this is done the Category and all the products are disabled and will not show in your catalog. To enable the Category go back and turn the red dot to green.